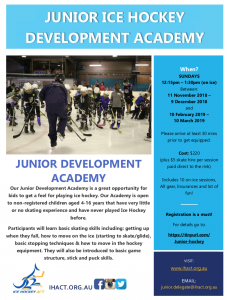 Our Junior Development Academy is for non-registered children aged 4-16 years that have very little or no skating experience and have never played Ice Hockey before. how to move in the equipment. They will also be introduced to basic game structure, stick and puck skills. All sessions are run by experienced accredited IHACT Junior Coaches and helpers. Player Eligibility: Non- Registered children aged 4 to 16years. Please note: Places are limited. Inclusions: 10 on-ice training session, all required gear, Insurance and lots of fun! REGISTRATION on ESPORTSDESK IS A MUST: Due to insurance requirements only children who have registered will be able to attend the Junior Development Academy. Please contact the Junior Delegate for more information. For any questions regarding registration please contact the Registrar.